Dr Robert Hubbard, the engineer behind the invention of HANS device, has died at the age of 75. Hubbard was a professor of materials science and mechanics at Michigan State University until his retirement in 2006. He conceived the HANS device in collaboration with his brother-in-law and IMSA SportsCar Championship racer Jim Downing. The HANS device became compulsory in many racing series. The HANS device was born when Downing and Hubbard realized that drivers were being killed in racing accidents because their heads were not restrained, which led to basilar skull fractures. The loss of Downing's friend Patrick Jacquemart, who crashed his Renault 5 Turbo in testing at Mid-Ohio in 1981, was the driving force behind their quest for a solution. Their research was conducted on limited funds, with just a small business grant from the state of Michigan. After some early experiments Hubbard filed a patent in 1985, and then Downing raced with a prototype Model 1 HANS for the first time at the IMSA season finale at Daytona in November '86. 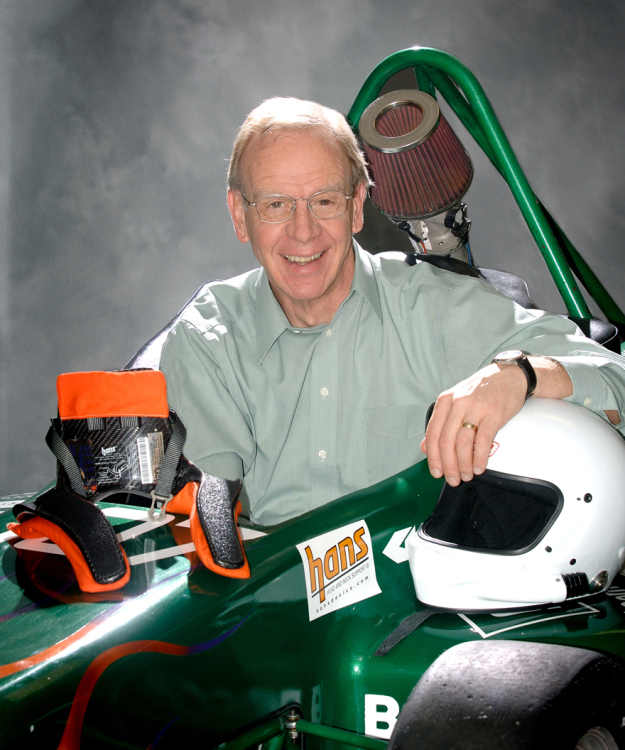 Pioneering sled testing conducted with fellow academic engineers at Wayne State university in Detroit helped Hubbard compile research papers that formally demonstrated the value of the HANS device. The first production example was sold in 1991. Bolstered by extensive testing by Mercedes engineer Hubert Gramling, who abandoned airbag research that he'd been conducting in conjunction with the FIA, the HANS device was officially adopted in F1 in 2003. The HANS device had already become compulsory in IndyCar. The death of Dale Earnhardt Sr in the 2001 Daytona 500 would change that. The HANS device already had a presence in NASCAR following a spate of recent accidents—several drivers were already using one at Daytona—but the loss in 2001 of the biggest star, Dale Earnhardt, in the series proved decisive. Downing would later recall that HANS device sales went from 250 since its inception to 3000 sold by the end of that year.